TechnoSolvers Blog: What's the whole deal about this Black Hole picture? What's the whole deal about this Black Hole picture? What is a black hole and how are they created? So this image that is making headlines around the world is a zoomed in picture of a black hole? Nope, not in the sense that you probably think it is. This image is not what is visible to the human eye. In fact, despite black holes being so, well, black, they can actually wreak havoc on everything around them. Therefore, the easiest black holes to find and study would be a black hole near lots of matter or other stars. The matter nearby would be constantly ripped apart and heated to extreme temperatures by the gravitational field causing it to be extremely bright and jets of matter would be thrown into space. So now we had an idea of what could be causing certain bright spots in the universe, but these areas were so bright and far away that there was no way to see what is in the middle of those immensely bright regions. But the telescopes commonly in use today to study the cosmos are not the optical telescopes you are accustomed to using, they are radio telescopes. Because many astronomical objects emit radiation more strongly at longer wavelengths than at visible-light wavelengths, radio telescopes can show us things about the universe that optical telescopes cannot. Data is collected from these telescopes and combined to make a digital image of what the telescope is “seeing”. Over the last half-century, radio astronomers have used radio telescopes to make most of the recent exciting discoveries. 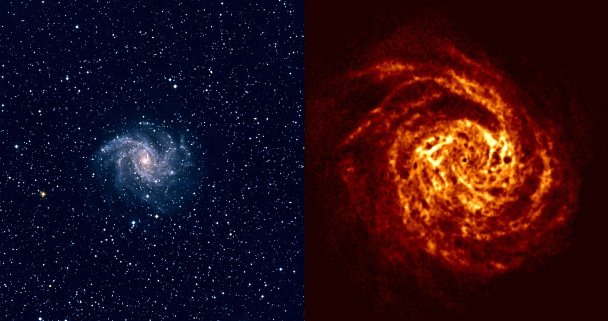 You can see from the picture below that radio telescopes offer better clarity than an optical telescope, in fact these two pictures are the same scale! You can just see more of the spiral arms of the galaxy on the radio spectrum vs visible light spectrum. The consensus was that the only way to study a black hole would be to create a very large special radio telescope, like the hubble telescope, only much, much larger. So, they finally made a radio telescope powerful enough to take this “picture”? Instead of creating a new large radio telescope, a group of scientists proposed that they would take several of the world’s most powerful radio telescopes, and modify them to be able to work together as one giant telescope the size of the Earth, collectively called the Event Horizon Telescope. 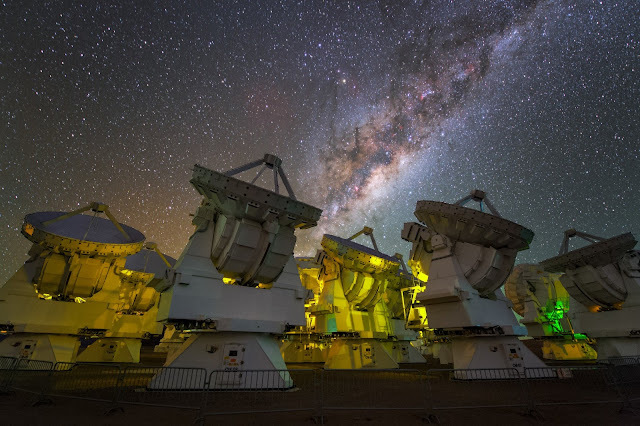 The telescopes contributing to this result were ALMA, APEX, the IRAM 30-meter telescope, the James Clerk Maxwell Telescope, the Large Millimeter Telescope Alfonso Serrano, the Submillimeter Array, the Submillimeter Telescope, and the South Pole Telescope. Several NASA spacecraft and ground observatories also participated in this event. After years of getting ready and then waiting for basically good weather to happen simultaneously on the whole planet, a window was agreed upon. Over 4 days in April 2017, the largest and most powerful telescopes spanning the globe all pointed towards their target, M87. Great, so they pointed it at their target and what was the result?! Well, first of all there was no immediate result. 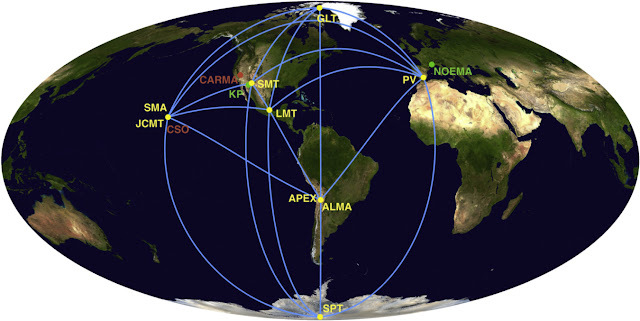 Each individual telescope array held a piece of the puzzle. There was a TON of data that was recorded from each telescope over the four days. Thousands of Gigabytes of data from each telescope location was flown in to special supercomputers at MIT to combine and process the data. Since this had never been done before they had to figure out a way to get all the data aligned and combined into a single image. At the same time, everyone knew that they were all working on what could possibly be one of the greatest scientific achievements of the century. Everything that they presented was going to be under the highest scrutiny of the scientific community. To make sure that the team create a true image from the actual data, they organized four separate teams of scientists. Each team was not allowed to talk to any other team members from other teams and they worked in complete secrecy. After several months each team had devised a way to combine the data from all the individual telescopes and submitted their algorithms and final image. Once the last team was complete, all the images from each team were compared, and they all showed virtually the same image indicating the data was accurate and the image real. The four teams methods were analyzed, adjusted, and combined to form a single image from each day that the suspected area of the black hole in M87 was observed. “What the image shows is gas heated to millions of degrees by the friction of ever-stronger gravity, scientists said. And that gravity creates a funhouse effect where you see light from both behind the black hole and behind you as the light curves and circles around the black hole itself”, said astronomer Avi Loeb, director of the Black Hole Initiative at Harvard. All the data lined up exactly with the predicted models of what a black hole would look and behave like. The 200 scientists participating worldwide agreed to keep these results secret while they went to work analyzing all the data and began writing six extremely technical papers to back up their discovery. Everything was cross researched, and several computer models of black holes were overlaid on top of the data to ensure that everything seemed accurate. Simultaneous world-wide press conferences were scheduled for April 10, 2019 and the first ever image of a black hole was shown to the world! Helped me to understand it more. I love space science. Tired of scouring the web looking just for cell phone related results? Try my custom cell phone Google Search Bar above that automatically performs a Google search on my handpicked collection of the top 50 most useful cell phone websites. I created this for my own use at work to filter out all the garbage results I would get when doing cell phone troubleshooting. Your search results will appear below when the page refreshes after your search. Let me know what you think in the Comments section, if I get enough interest I may launch a full site and keep it maintained. Welcome to the official blog of Charlie Peck and Technosolvers.com. Technosolvers.com Copyright 2010. Awesome Inc. theme. Powered by Blogger.